The celebrations of Zidane’s return at Real Madrid have been cut short after a disappointing loss against Valencia in the last match. The Los Blancos had won the first two matches under the returning boss before tumbling at the Mestalla. Real Madrid host Eibar in the next match and they would be expected to get back to winning ways here. With 2 wins in 2 matches, it looked like Zidane was starting to work his magic again at Real Madrid. The Los Blancos won against Celta Vigo before downing Huesca and it all started to appear good for them. However, the loss against Valencia has exposed the frailties of this Real Madrid side. Despite having most of the possession and more attempts at goal, Real Madrid were undone by an incisive Valencia. Zidane was hugely successful in his first stint and he would be quick to realize that the second one is not going to be easy. The Real Madrid team has changed much over a year, not just physically but mentally as well. Thus, the French manager will need to lay a new foundation of success. 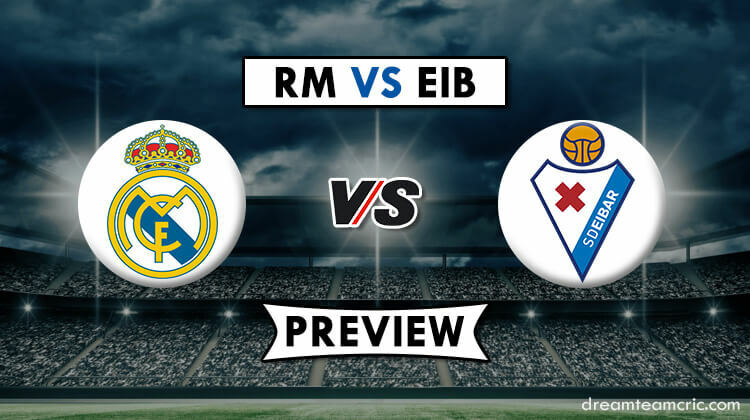 Real Madrid’s next opponents should not be a big worry for them as Eibar is a team which is leaps and bounds below the might Los Blancos. However, they would do well to get rid of any complacency and take this match seriously to get their groove back. There are just 8 matches remaining for the season in La Liga and Zidane would be wise to use them to find a new balance in his old team. Marcelo is suspended for the Los Blancos and Sergio Reguilon should replace him. Pedro Bigas is a big doubt for Eibar due to an injury, while Papa Diop is suspended. Benzema has been the best player for Real Madrid in a disappointing season. Bale is expected to be given a chance and he has the quality to make it count. Sergi Enrich is a quality attacker who can impact the game.